Besides an introductory chapter on "cognitive" processes in the biomolecular domain (part A), this essay presents some reflections on vertebrate behaviour from a neurocybernetic point of view. First, some comments are given on the problem of modeling organism-environment interactions (part B). It is shown how environmental features enter the nervous system by altering a behaviour-immanent sensorimotor circuit. In following a coarse phylogenetic line - with only consideration of three major stages (fish, tetrapodes, and primates) - it is argued that extensions of the sensorimotor circuits are parallelled by increasing complexity of locomotor behaviour, part C.
The last part, D, deals with permanent bipedality of hominids and points to two consequences of the fact that arms and hands lost their locomotor function: (i) a compensatory drive towards object manipulations, and (ii) an additional quality ("Eigenquality") in experiencing own manipulations under visual selfcontrol. The paper is intended to support a provoking hypothesis: Could the origin of aspects of selfconsciousness have been just (due to) an extra control loop of arm and hand movements? If we believe in evolution, we accept that live originated in an aqueous environment. Whether we take a cell. as the minimum condition which shows all categories of life phenomena, or even a precellular, molecular phase, makes no difference: if there was cognition it was without psychology. Biologists live largely within a man-made environment; the main problem of dealing with cognition at the infrahuman level will be to get rid of anthropomorphism. Did Konrad Lorenz do a big step forward (and backwards along evolutionary lines) by saying: "Life itself is a cognitive process" ? (1973). Similarly, Humberto Maturana stated: "Living systems are cognitive systems, and to live is to know." (private communication). 1. Thermodynamic motion mixes the interactions in a chaotic manner until complementary structures "catch each other". Cognition at the molecular level can thus be seen as biophysicalchemical interactions, selective by pattern-matching between "spatially complementary" structures (note 1). Water, an ever-changing medium providing a lot of variety of interaction partners in rapid succession, is the necessary precondition. Now let us embark on the stream of evolution. After development of protective double layers, the cell shielded off hydrolytic influence from the aqueous environment. Catalytic interactions now worked within a spatially autonomous, but energetically and informationally open system. Food recognition and communication (sexuality !) were still mediated by molecular interaction with receptors "waiting" an the cell surface. Our chemical senses (taste and smell), hormone effects, and immunological "recognition", all work on the direct-contact-complementarity principle. Contact problems had to be solved, too, when cell colonies appeared and started a new, most sucessful level of life phenomena, that of multicellular organisms, the metazoans. Size and volume of higher metazoans prevented external thermodynamic motion forces to push them around. Metazoans had either to stick to the ground (plants, and sessile animals), float more or less freely (e.g. some cnidarians), or invent locomotion. Organismic movement must not be random. Orientation must bring about the connection between organism and its needs (food, shelter, partners). This is where sense organs (note 2) are necessary, with connections to the nervous system, making it a central nervous system (CNS). (note 3) with movements. Behavior was never independent of sensory input. Such a description shows how spontaneous movements can be explained as reactions, see Fig. 2. 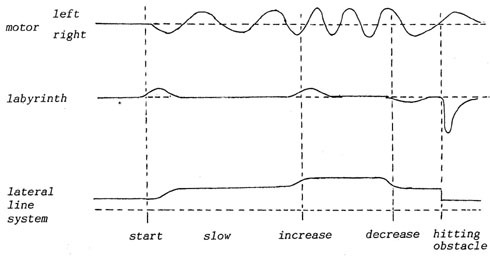 The stimulus-response model of classical behaviorism can be easily recognized, which gave rise to abundant literature. An experimenter can administer artificial stimuli without bounds, and so manipulate resulting behaviour. Ashby 1952: p.37: "...muscles affect the receptors (by effects transmitted through the environment)..." "...most physiological experiments are deliberately arranged to avoid this feedback". One could say that by locomotion the organism stimulates its own sense organs. Or, alternatively: sensory input is not independent of behavior like locomotion. Fig. 3. The organism (0) acting on the environment (X), and sensing it. Fig. 4. Two kinds of interactions with the environment. Fig. 5. An orientational system. a. The system is not a closed material circuit, it consists of various dynamic processes chained together. It runs as follows: motor neuronal discharge - transmission along motor pathways - contraction of muscles - displacement of the organism in the environment - perception of a changing environment - transmission along sensory pathways - feeding into the CNS, convergence (in yet unidentified ways) an the motor areas - activation of motor programs. b. Environment change is subjective experience, an external observer can only describe an organism in locomotion, he can only imagine an "environment-shift-effect" for the observed organism. Experiences attributed to another subject without verifiability for the observer, that is where psychology begins. c. Motor pathways leave the brain in nicely ordered, parallel fibres, sensory input is dispersed, coming from many directions. Often several sensory responses (vestibular (note 4), visual, tactile, chemical) are fed back simultaneously, Fig. 6. Fig. 6. Multiple sensory responses. e. The explanation of adaptation is a big problem. Apparently, the CNS can use its afferent information to react in an appropriate, oriented manner to environmental features. We call the behavior of animals adaptive, often goal-directed. If so, the vast amount of sensory input must be filtered, selected, reduced, and finally be used as triggers and regulators for the motor apparatus. According to J. Gray (1950), motor control in vertebrates seems to have proceeded from an endogeneous, preprogrammed, largely rhythmic type, as described for fish by E. von Holst (1969,1970), to an increasingly modifiable type of motor control dependent an complex sensory processing. From the brains of higher vertebrates there is anatomical evidence: the structures doing the information-processing of sensory input appear to have "overwhelmed" the motor apparatus. Fig. 8. Complementarity of organism and environment. 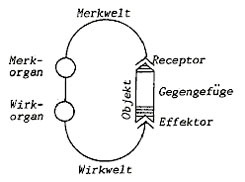 Being a neurologist, von Weizsäcker noticed complementarity in movement-perception acts and states a mutual exclusion-principle insofar as perception can be replaced by spontaneous movement (and vice versa). He thus drew attention to the inseparability of movement and perception: "sensomobility". His basic metaphor for the circuit is "Zange" (a pair of pliers), by the Funktionskreis the subject grasps the object. We use a tree model to show the organization of our (human) NS but to arrive at it we have to turn the basic sensori-motor (or kin-esthetic) loop/circuit on its head. The stem is the main motor output of the CNS/brain, the corticospinal tract leaving the head through the occipital foramen (in reality “down”wards) into the vertebrate column. In each intervertebral joint motor nerves sprout to the side innervating the arms and legs – thereby spreading out to the physical world, towards objects etc. Touching means the objects push back, and this ”echo” of the motor pulses “comes back” through the skin - now called sensory stimuli (see dropping arrows!) - and from the skin these converge towards the vertebral column. Running alongside the outgoing motor fibres, but backwards, the lemnisci (sensory bundles) enter as part of the spine’s medulla the foramen, go to the thalamus and then spread into the CNS, its cortical areas. “Cognition work” begins within the network between incoming sensory patterns feeding into association centers, then converging at the (pre-) motor centres to be released as the outgoing motor patterns. The spreading and convergence are aspects which in a diagram can only be shown if it were four-dimensional: the self-channeling function can be drawn schematically, Fig. 11. 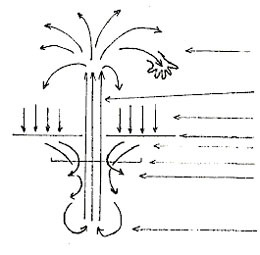 The fountain-metaphor is poor because some important senses are more linear than surface-like (e.g. the labyrinth), and nothing is explained on how motor patterns can be constrained by counter-flowing sensory ones. Actually, there is an area where interaction takes place: the reticulo-thalamo-cortical system. Multiple interactions by "circuits within the circuit" are probable, see Fig. 12, see also Hernegger (1984), who gives a thorough discussion of development of the formatio reticularis during evolution. Fig. 11. A self-channeling system. Fig. 12. Multiple interactions of "circuits within a circuit". Motor fibres and sensory fibres conduct patterns in contrary spatial directions (see above), but can be drawn in parallel as a function of time. This can be seen from an example how excitation patterns traveling in a functionally closed system can "match", which means one part of the circuit is "illustrating", "commenting" the other ("selfreference"). Imagine a swimming fish. Because the labyrinth is stimulated only (but immediately) by acceleration, and the so-called lateral line system in fish monitors velocity of passing water, we can draw an episode (fish swimming, increasing and decreasing its velocity, finally hitting an obstacle) by just parallelling their patterns with the (loco)motor one. Fig. 13. Correspondence between traveling excitation patterns. One could "ask" the visual and the olfactory sense, and so can the fish. Two more things can be shown even in that sketch: Motor patterns are not altered much by sensory input (say environment), but patterns of the two senses are strongly dependent on motor acts and environmental features together! We might assume that dependence of the first sort will increase by locomotion on a formed and firm substrate (instead of through amorphous water), which is what J.Gray (1950) has described. But how about the second dependence, the inseparability of self-stimulative and environmental effects in sensory patterns? Will the visual sense, always regarded as the most accurate in "depicting" the environment, in "mirroring" it in a "photographic" way, show that dependence too? 2. Assume that there is no eye-muscle activity. 3. Only two rows of retinal elements are recorded, a horizontal one and a vertical one, Figure 15. Fig. 15. Vertical and horizontal visual detection. 4. Consider the following situation: Our fish swims slowly and passes both a nearby and a far-off stationary small object. Simultaneously a swarm of fish swims against its own direction and one of the fishes passes exactly the horizontal line of "retinal" elements. Finally our fish also bumps into an obstacle. Fig. 16. View from above. Fig. 17. "Slot eye", vertical row. Fig. 18. "Slot eye", horizontal row. Apparently we can identify much easier with the vertical row, probably because locomotion is perpendicular to it. Anyhow, the sketches show what complexity the visual system must integrate to represent the environment as a (pseudostatic) picture. Two more remarks: Surely eye movements will be used to "follow" a passing object by stretching it to "real" dimension. If the fish detects a "homogenous pattern which increases in a symmetrical way in the frontal part of both eyes", this means impending collision. In general, as J.Gibson (1979) has shown, the full two-dimensional retinal image-pattern changes with locomotion in a regular way: parts of it leave an one side, other parts enter at the opposite border, as the "frame" of the retinal image scans along the environment. So the motor pattern of locomotion is not primarily represented within the image, but the shift-pattern of the whole image is "in tune" with it. The pattern of appearance and disappearance of visual pattern elements does represent time-dependent properties of locomotion (eye movements excluded). We are thus led to the conclusion that information about the environment enters the organism by interfering with an already patterned sensorimotor "carrier system". Stimuli in this way do not trigger reactive behaviour, but they are modulating, superimposing on a continuously interacting organism-environment-system (note 5). External observers will have access to these processes only when recording techniques during free locomotioe behaviour are developed. So far the sensorimotor system was introduced with regard to animals moving "freely" like a fish. Every muscle action (except digestion and respiration of course) will influence the relationship of the whole organism to its environment. But evolution did not stop with fish. Most of the reptiles pull and push their belly across the substratum. Mammals have to balance their body, fighting gravity even when standing. During locomotion certain patterns of gait (walk, trot, canter, gallop) produce the result of a smooth environmental pass-by (Gibson 1979). Proprioception offered the possibility for an internal information loop. Sense organs within muscles and joints, or next to them give the CNS "insight" into muscle contractions and joint positions. Posture and locomotion are now controlled along two pathways: the orientational circuit and the internal proprioceptive one (note 6). Turning the head produces a striking subjective change of the visual environment (much the same as eye movements) without affecting the locomotor apparatus. Still orientation is not disturbed! Erich von Holst and Horst Mittelstaedt (1950) introduced a solution for these achievements not to be explained by reflex terminology. If there is no reaction to an environment shift effect following a motor command, it must be counteracted, extinguished - why not by a "copy" of the very motor command? Except for a few studies an the "overload-protective" function of such attenuation of self-induced afferences (Stein, 1978), the importance of the reafference principle might not yet be adequately understood. Interestingly, manipulation started with the snout! The principle is as follows: A paired system of levers is arranged for a coordinated snapping movement with continuous variability in distance and compression. Capable of "instant adaption" this pair of pliers has evolved in fish and has changed anatomical parts since, but gripping, holding, carrying are functions fully developed mostly in mammals and birds. Held objects are integrated in the mechanical body system, they are "limbs" but without muscular or nervous connectivity. This means that the existing sensorimotor programs must adapt to additional loads - new coordinations between labyrinth, neck muscles and locomotor apparatus have to be, and are established (Horn 1983). Evolution did not stop with tetrapodes. On the contrary, two ways of increasing neurocybernetic complexity were successfully followed. Birds by flight, and primates by tree climbing, really conquered another, the third spatial dimension. Leaving birds aside we look for the major consequences of "quadrumanuality" to arrive finally at the latest condition: bipedal bimanuality. We can easily see how mechanical connections remain the same (contact between limbs and environment) but functional chains ("causality") change directions. Muscles (in hanging flexors "carry" body weight, in standing extensors support it) and the sensorimotor system must rearrange forces and impulses, the labyrinth is forced to accomodate new, rotatory accelerations. Many authors have referred to the importance of eye-hand coordination in tree climbing and the development of binocular vision for depth perception, here we need only stress the tight interaction of the two achievements and their underlying gain in neurocybernetic complexity: For the first time in evolution animals see what they are doing. (Canids, carnivores and rodents either lack specialised hands or cannot afford reducing attention to further environment). Directly controlled reaching establishes a small, but radically new range of activity around the animal: Intention movements themselves can be observed, for the first time the aim and its approach-activities are monitored, even their contact is observable. Surely direct calibration of distance is qualitative progress in environment-adapted behavior. additional visual control were for the first time freed from stabilizing and Iocomotive functions. D4. Hands: pacemakers for hominid cognition? It is assumed here that arms and hands gained new functions, that their sensorimotor apparatus, "running free", chose new interaction partners. Because head and vision left proximity to the ground, parts of the environment had to be lifted to the manipulative distance. Voluntary motor acts had to concentrate an the handled object and move it with little effort (compared to levering the whole body). These motor acts which are "individual-bound", "environment-absolute", established a sensorimotor circuit separated from the locomotion-driven one. One can say that for forelimbs the environment has shrunk to a passively moving object, that "behaviour within" had become "behavior on". Let us stop here. Bipedality anteceded hominid brain enlargement as is shown by fossil evidence. Consequences emerging out of the progressive sensorimotor complication contributed to that development. (2) Euglena may serve as a minimum model for an orientation-locomotion-system. This famous unicellular organism is propelling itself by flagella and choosing bright-lightened environments with the aid of a microscopic eye-spot. (3) The term Umwelt was coined by von Uexkuell to cover only such aspects of the environment which are relevant to a single species. I use environment in that sense, automatically indicating that our human concepts of environment can differ from the one represented in various animal species. (4) The most important feedback of locomotor activity might be the labyrinth registering change of momentum in any direction. Methodological problems - the hidden location in the head (any electrodes would interfere with free locomotion) and the "a priori-like" information-processing make that sensory mode a remote, "underlying", inconspicuous one. These characteristics may yet indicate a fundamental role within the "sensory chorus". (5) Humberto Maturana in his terminology might say stimuli do trigger structural changes in the system, but nevertheless conservation of organization is not endangered by such "perturbations". (6) Proprioceptive feedback can in a certain way replace the orientational circuit, e.g. complex nocturnal activity becomes possible. Reptiles can not use this behavioral niche, but homoiothermal mammals can (and possibly outdated the dinosaurs in that way). Ashby,W.R. (1952), Design for a brain, Chapman and Hall, London. Chapeville,F. & Haeenni,A.L. (Eds) (1980), Chemical Recognition in Biology, Springer, Berlin-Heidelberg, New York. 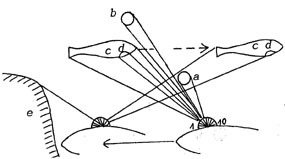 Gibson,J., (1979), The Ecological Approach to Visual Perception, Houghton Mifflin Company, Boston. Gray,J., (1950), The Role of Peripheral Sense Organs during Locomotion in the Vertebrates, Sym. Soc. Exp.Biol. 4. Hernegger,R. (1984), Vom Reflex zur Selbststeuerung, Profil Verlag, München. von Holst,E. (1969 or 1970 ? ), Zur Verhaltensphysiologie bei Tieren und Menschen I & II, R.Piper und Co, München. von Holst,E. & Mittelstaedt,H. (1950), Das Reafferenzprinzip, Die Naturwissenschaften 37, 464-476, 1950. Horn,J. (Ed.) Multimodal Convergences in Sensory Systems, Gustav Fischer Verlag, Stuttgart. Ingenieros,J. (1922), Prinzipien der biologischen Psychologie, Felix Meiner, Leipzig. Lorenz,K., (1973), Die Rückseite des Spiegels, R. Piper und Co, München. Lovejoy,C.O. (1981), The origin of man, Science Vol. 211, Nr.4480, 341-350. Maturana,H.(1986? ),The Biological Foundation of Self Consciousness and the Physical Domain of Existence (manuscript). Roberts,T., (1978), Neurophysiology of Postural Mechanisms, Butterworths, London Boston. Control of Locomotion, Ann. Rev. Neurosci. 1, 61-81.
von Uexkuell,J. (1930), Die Lebenslehre, Mueller & Kiepenheuer, Potsdam. von Weizsaecker,V. (1940), Der Gestaltkreis. Georg Thieme Verlag, Leipzig. Manuscript received: 20-3-1985, final revised version 28-11-1986.